Pascale Lagacé has played a critical role in solidifying Resolute’s position as a global sustainability leader. As Resolute’s vice president of Environment, Energy and Innovation, she oversees strategies for reducing our carbon footprint and ensures the company’s adherence to rigorous environmental standards. 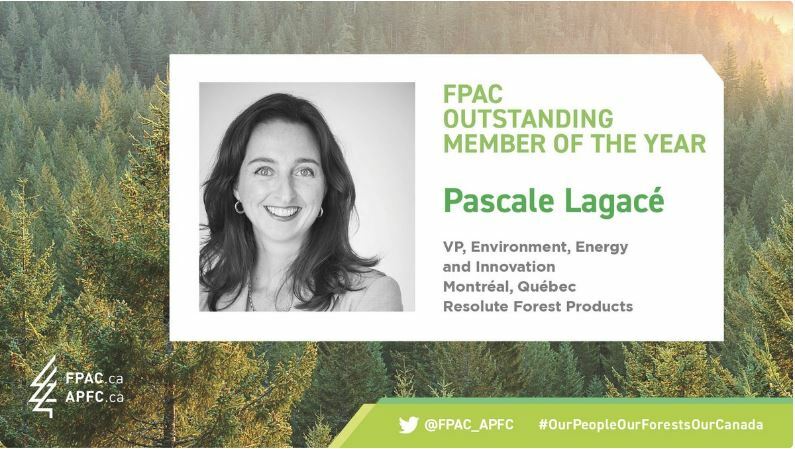 We are proud to announce that the Forest Products Association of Canada (FPAC) has recognized Pascale’s substantial contributions to the forest products industry, selecting her as its Outstanding Member of the Year for 2017-2018. Weyerhaueser’s Wendy Crosina also received the honour. FPAC commended Pascale for her work in several areas, particularly her engagement in securing the role of the forest products industry as a key player in Canada’s emerging bioeconomy. Her efforts have supported the Canadian government’s Innovation Superclusters Initiative, helping to build Canada’s sustainable, low carbon economy by strengthening the country’s most promising industries. Thanks to Pascale’s guidance, Resolute has dramatically reduced our direct and indirect greenhouse gas emissions (scope 1 and 2) by 76% over 2000 levels. Furthermore, we have started tracking and publicly reporting our scope 3 emissions, significantly improved our environmental incident performance, and achieved or initiated ISO 14001 certification for all our operations. The company is in the process of transitioning to the 2015 version of the ISO 14001 standard. Pascale and her team have also developed a new risk identification process in addition to implementing a risk auditing program of Resolute’s pulp and paper mills. This is not the first time Pascale’s leadership has been recognized. In 2015, she received a silver Stevie® award in the International Business Awards’ Woman of the Year category, and also earned a place on Canada’s prestigious Clean 50. Congratulations, Pascale. This award is well deserved!